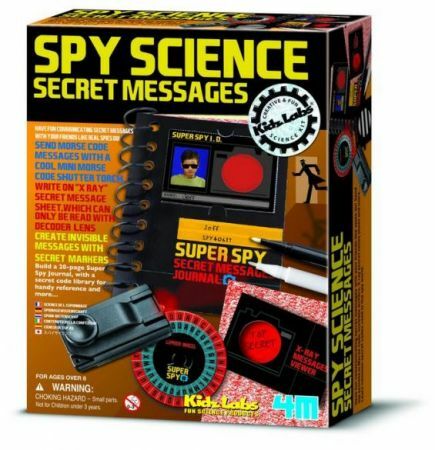 Have fun communicating secret messages with your friends like real spies do! 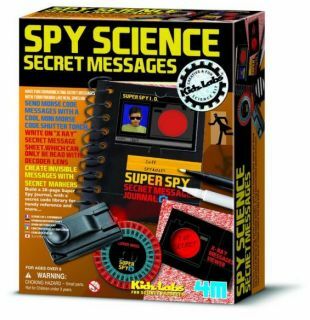 Send Morse code messages, write on X-ray secret message sheet, create invisible messages with secret markers! Contents: 1 set of paper for making inner pages of the journal, 1 set of cards for making the journal covers and other accessories, 2 red filter lenses, 1 plastic binder, 1 plastic bag, 1 Morse Code Torch, 1 invisible message writer (white), 1 invisible message developer (black), 2 message capsules, 4 message capsule covers, double-sided adhesive tape and detailed instructions with fun facts.